A few years ago we released our short film online and then shared the tactics we used to get views and industry attention in one of our most popular articles titled How We Launched Our Film Online. In the years since, we’ve had the pleasure of working with thousands of filmmakers to release their short films to millions of people around the world, many of which have gone on to achieve amazing things. Over the past year, we’ve interviewed and surveyed hundreds of successful filmmakers to understand directly what works and what doesn’t when releasing a film today. What becomes immediately clear is the widening chasm between what most filmmakers actually care about and what the conventional approach delivers. Fear not! A major shift is underway, and a new path is emerging! One built on an understanding of the fundamental disruption that has reshaped our media landscape over the past decade. This guide is for anyone looking to harness the full potential of their film. For you, we want to share our secret sauce—the release strategy that we’ve been honing for years to help filmmakers reach audiences around the world and kickstart their careers. Making a short film is a long, tough journey, and releasing it to the world can be one of the most stressful moments you’ll face in the process. Where to start? Where do you premiere? Which festivals? Which online sites? Which platform? How do you think about sales? Will anyone see it? Will anyone care?! Hold up for just a sec there, partner. First thing first: ask yourself what it is that you really want from your short film release. We recently surveyed hundreds of experienced filmmakers who’ve gone through the process of making, and releasing, a short film (some multiple times), and across the board two things stand out as the most important outcomes from a successful short film release: opening up new career opportunities, and finding an audience. While short films are amazing works of art all their own, for many ambitious filmmakers they primarily serve as a proving ground for something bigger. You make a short film so that you can make a feature film, or a hit Netflix series, or a Cartoon Network show, or to join a commercial roster, or simply establish yourself and connect with other talented collaborators. Short films are a great way to showcase your voice as a filmmaker and kickstart your filmmaking career. Ultimately what drives opportunities in today’s media landscape is exposure. Hundreds of filmmakers featured on Short of the Week have gone on to bigger things, from Hollywood films to streaming deals, festival breakouts to Super Bowl commercials. Behind every one of those successes is an accelerator—an executive handing the keys to a franchise, a financier greenlighting a project, or an an experienced producer who hops onboard a talented writer/director’s script. The common factor is exposure to the right person who can recognize talent and accelerate a filmmaker’s ambitions. Every aspect of an exhibition and distribution strategy should be laser-focused on maximizing the opportunity that your work is discovered by the right person. A hundred million views online won’t guarantee that you land a Netflix deal, nor does a mere 100 views forgo that possibility. But being seen as much as possible progressively increases your odds. For the past decade, the conventional strategy has been to stretch out your film release over years, starting with a festival run, incorporating a sales period with exclusivity windows, and culminating in an online release. This worked in a system controlled by gatekeepers. But in today’s world driven by exposure and discovery, there is a better way. Be Everywhere. You can now reach millions of people around the world. Go to where the audiences are and get your short film on as many platforms as you can. Lower barriers to make it as easy to view and share your film as possible. You likely don’t know the producer, manager, or intern who may discover you or the editor who may feature you on a big platform. Broaden your reach and allow serendipity to happen. All At Once. We live in an increasingly noisy world. Your goal is to pierce through that noise by compressing your film’s release window to build momentum. It’s a tactic that marketers have used successfully in other industries like music, where big albums today are surprise drops rather than long unveilings. Deliver your message with one massive swing of the hammer rather than multiple light taps. In a noisy world, it works. It also saves time. Rather than spend two years slowly rolling out a short film and getting a response back in piecemeal, push it all at once and get a response, and get back to making films. This rapid feedback is really important to filmmakers still developing their voice. Consider The Daniels, who made and released dozens of wacky short films and music videos, honing their unmistakable blend of absurd humor and emotion, before tackling their Sundance prize-winning feature, Swiss Army Man. Here’s how you can put Be Everywhere All At Once into action. As trailblazers in promoting free online releases of short films, we’ve occasionally been accused of fomenting a “festivals vs. online” debate. If you adhere to a ‘Be Everywhere All At Once’ mindset, you realize that any and all exhibition avenues are simply opportunities to pursue exposure with the goals of audience and opportunity. What’s important is to think strategically about these avenues’ strengths and weaknesses and relate them back to your particular circumstance. Film festivals hold a special allure for filmmakers, so it’s important to be clear-eyed about what to expect. Festivals are a great way to experience the thrill of watching your film in front of a live audience. They’re also a great place to build relationships with other filmmakers and programmers. Top-tier festivals can provide critical validation, something that can open doors throughout your career and act as criteria for approving future projects. All of these are good things. However, many filmmakers overvalue the impact that a festival can realistically have on their career trajectory. Even at top-tier film festivals, short films are often an after-thought amidst the buzz and celebrity of the feature film programs, and attending screenings is an inefficient use of key decision-makers’ time, so few (if any) attend. The vast reach and accessibility of the internet means that your film can reach an audience of millions. Online is how a short film like Kirsten Lepore’s lovable Hi Stranger can go from a small release on Vimeo to a segment on Stephen Colbert’s The Late Show. For most filmmakers, online now presents their biggest opportunity to connect with audiences and generate interest. As the world of online creators is exploding, agencies, managers, producers, development teams are increasingly skipping festivals and turning first to online sites in search of new filmmaking voices. It’s much easier for an intern or assistant at a studio or production company to share a link to an online film with their boss or partners. The next generation of filmmakers are now being discovered online. 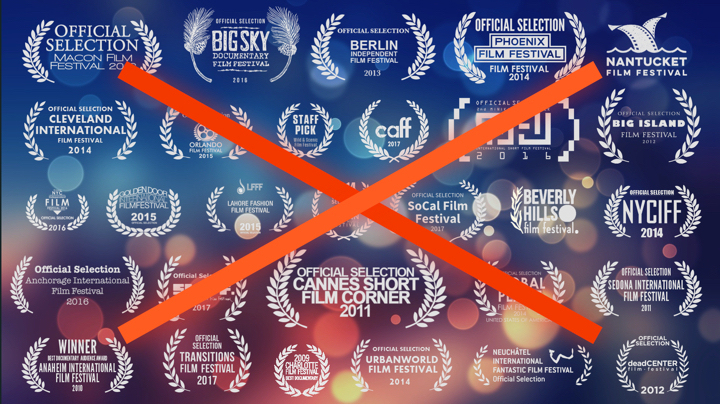 Don’t Submit to Hundreds of Film Festivals! Many filmmakers are spending too much money (avg $1537) submitting to too many festivals (avg 65) and wasting too much time (avg 24-month festival run) for too little exposure. Outside the top-tier festivals, you’re likely playing to a local audience limited to those who can attend the screening. Furthermore, since the strength of festivals is the power to forge relationships through face-to-face contact, don’t pay to submit to festivals that you won’t attend! Tip: Don’t cover your promotional materials with 100+ laurels from small festivals. It may impress your parents, but what this says to programmers like us is that you don’t really know what you’re doing and you’ve wasted a lot of valuable time. There are only a handful of festivals that offer any real prestige. Just as many filmmakers overvalue festivals, many also undervalue their online release. One of the top regrets we hear from filmmakers is that they waited too long to put their film online. Unknown to many filmmakers is that the most major festivals don’t care whether or not your film is online (see our Festival Eligibility Guide). Make submitting to online sites part of your initial submission round—don’t sit on it. Take advantage of the fact that online sites can evaluate your submission year-round, get you a response quickly, and publish weeks or months later at your discretion. Your best position is to know all of your options up front so that you can plot your optimal release strategy. Once you know what options you have, pick your premiere partner carefully. A high-profile premiere at a top-tier online site or film festival can provide the validation you need to propel your film’s release. Choose an online site or festival that can reach your film’s audience and has the clout to open further doors. If you premiere at a festival: One strategy is to secure a premiere at a big name festival then ride the buzz and drop your short film online soon after—not a year later when the buzz has died down and everyone has forgotten your film. David O’Reilly was one of the first filmmakers we saw do this in 2011 when The External World premiered at Venice & Sundance, then was online shortly after. Further, let people at the festival know that your film is online—it gives those you meet something to follow up on and share with their network. If you premiere online: Secure a premiere on a prominent online site and use the momentum to reach other sites and festivals. It’s not uncommon for films that make a big splash online to be solicited by bigger festivals and offered entry fee waivers. We’ve seen this with the animation shorts that comprise Late Night Work Club, whose films have played and won awards at SXSW, Ottawa, and Clermont-Ferrand, after being released online. The internet has no shortage of advice on how to maximize views on YouTube, hack Facebook to reach millions of fans, or write the perfect tweet to make your work go viral. Ignore all of it. Over the past decade, the web has become exponentially more crowded and sophisticated such that the effort to build an online audience from scratch today is largely done by specialized professionals. Here’s a simple question to ask yourself: Do you want to spend your valuable creative time learning to become a digital marketer or a better filmmaker? The truth is that very few filmmakers have a knack for digital marketing. You don’t need to become a digital marketing guru. Filmmaking is a collaborative effort. You didn’t make your film all on your own, and you don’t need to strategize, distribute, and promote your film on your own either. All you really need to know is how to pitch your work. Think about it: it’s much easier to win over one person with an existing audience of a million than to win over a million fans yourself. Focus your marketing effort on fostering relationships with curators, programmers, and influencers that believe in you and your work. Engage people with clout on Twitter, Instagram, and film blogs. Learn how to craft a great email pitch. You don’t need to win over a lot of people if you win over a few with big audiences. There are many great reasons to make a short film, but making money is most definitely not one of them. The harsh reality is that most short films will make no money at all. A few lucky films will make a little cash winning prizes or licensing to TV or SVOD. But none, regardless of how big they get, will earn enough money to fully cover all of their hidden costs. The average filmmaker spends $12,500 on their short film, but the true cost when considering time and donations is almost 3x that at $34,000. As a struggling filmmaker, you may be offered money for your film by a distributor or licensor. More often than not, that money comes with strings attached like exclusivity that will limit exposure (more on exclusivity later). The best approach is to ignore money in these deals. It can be difficult to do when you’ve poured everything into your work, but the little money you make now is not worth the opportunity cost. Keep your focus on maximizing opportunity. Your short film may not make money, but it can lead to another job, landing a manager, finding a producer for your feature, or signing a deal with a studio that will get you a much more significant payout. Most distribution deals for short films don’t amount to much. But the worst ones, the ones that do real harm to filmmakers’ careers, are those that demand exclusivity. Exclusivity can tie your hands from doing anything with your film for months or years. It smothers both goals of ‘Be Everyone All At Once’ by limiting your reach to a single distributor’s audience and diluting any hype you generate by spreading it out over a long period of time. It effectively soaks your firewood in water. Read every agreement carefully. If a partner requests an exclusive time block—ask them to remove it. If they won’t, reconsider your options. Exclusivity always helps the distributor and hurts your film. It’s why we never ask for exclusivity at Short of the Week. Shant Hamassian worked with distributors for his popular horror short, Night of the Slasher, but he made a point to hang on to the online rights where it’s done very well. Go wherever audiences are—don’t expect them to seek you out. There was a moment years ago where you wanted to consolidate your views on a single video platform like Vimeo to reach critical mass. But today, every major platform now supports native videos and prioritizes videos uploaded directly to their platform over others. This means a short film uploaded directly to Facebook will get more views and engagement than a post that links out to Vimeo. Maximize your exposure and put your film on all the major platforms. Vimeo is great for reaching a filmmaker audience. But more and more short films are doing as well or better with general audiences on YouTube, Facebook, and emerging platforms like Instagram TV. Every platform serves a different community and offers a new audience to reach. The Secret World of Foley has been seen over 100 million times! 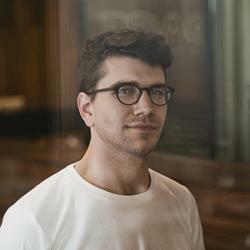 Director, Daniel Jewel did this all by connecting with tastemakers on Vimeo, YouTube, and Facebook, and allowing them to reproduce the film for their audiences. Being everywhere means everywhere! The internet connects your film to the entire world—all you need are subtitles. Once painfully difficult, subtitles are now quite easy and affordable to add to your film and can 2-3x your worldwide exposure. YouTube offers the option to create subtitles right in their editor or you can crowdsource subtitles from the community free of charge. Paid services like 3Play Media start at $3-5/min. Start with English, Spanish, and French and target other languages as needed. Here’s the Plan by Fernanda Frick has been seen by 2.5 million people and is subtitled in English, Spanish, and French. Don’t string out your release over years. The more outlets you can be on and awareness you can drive ‘all at once’, the greater the chance you have of breaking through the everyday media noise. Release a teaser 1 or 2 weeks in advance to build buzz and establish a core audience to amplify the release. Put your release date on the teaser. Coordinate a date with all of your launch partners to push the film live simultaneously. Most trending lists are built on algorithms that measure momentum (views/time). Your goal is to get enough views quickly to move up the list where bigger audiences and platform curators have a better chance of discovering your film. Apocalypse Now Now by Michael Matthews built up excitement with a teaser and a release date just a few weeks before releasing the full short. It’s finally launch day! You have a great premiere partner, you’re on most of the major platforms, and you’re prepped for international success. But you’re not done yet. The bulk of views of your film will hit within the first 1-2 days following your online release. Plan to spend a solid week amplifying the release, engaging with your audience, and recalibrating your plan. Amplify the release to your friends and fans on social media (the threshold for annoying your followers with self-promotion is way higher than you think). As your film makes its way into the world, you’ll quickly learn who’s connecting with it. Everything up until now has been a guess. Now that you have people watching your film, identify the communities it resonates with most. Use this to recalibrate your release strategy to target these communities. Use Google to identify publishers, interest communities on Reddit, Facebook groups, and influencers that have featured films similar to yours. The metaphor we use is dropping a stone into a pond—the waves are biggest in the center where they are tightest, but the weaker ripples extending out have more reach. Move from the center outward. Realizing that there was ton of interest in their story’s inclusion of a gay protagonist, the filmmakers behind In a Heartbeat coordinated coverage with LGBTQ organizations en route to 30M+ views. If your film takes off, things will happen quickly. Your inbox will flood with messages and you’ll soon begin fielding interest from a lot of interesting people. Everyone in these discussions will want to know where you want to go next. Be prepared to carry this momentum forward with a pitch. If you want to turn this short into a larger feature film or series, have a script or treatment ready to pitch. If you have other ideas you’re interested in pursuing, have those pitches ready. If you want to land a manager or rep, have a handful of ideas and goals ready. If you want to join a roster or collective, have your reel and resume ready to share. If you’re hoping to generate more work from this, clear your schedule. In any case, anticipate the next step. Even if someone isn’t the right person to directly help you, there’s a good chance they may know someone who might. This is an industry built on relationships. Some of the most successful filmmakers know what they want to get from their short film before they even begin making it. You’ve worked hard up until this point—don’t be caught off guard by success. 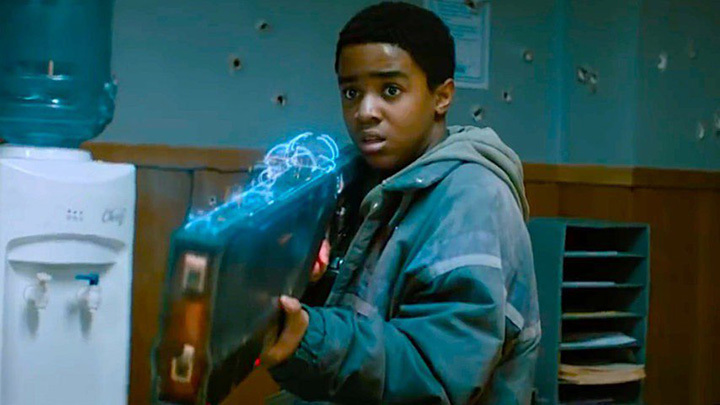 Bag Man by Jonathan & Josh Baker is a sci-fi short that the two released online initially to gauge interest, and is now a major feature film KIN (2018). 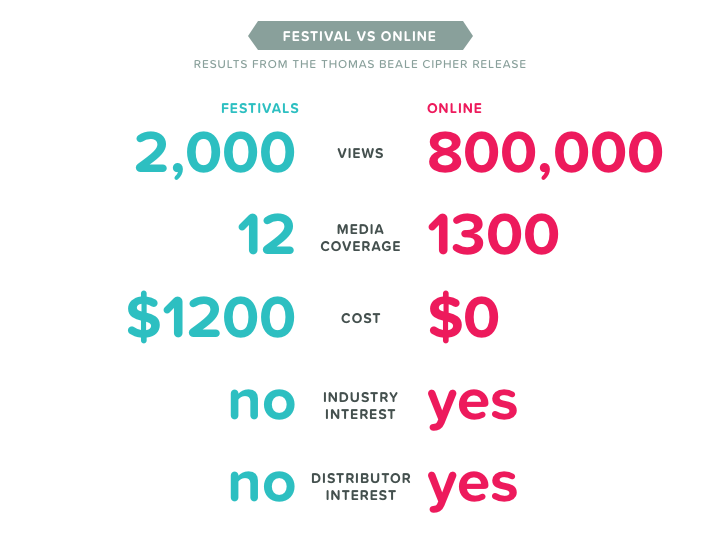 Create a online + festival strategy. Submit your film to online outlets early. Secure your premiere with a top tier festival or online site. Find partners—connect with curators to reach their audiences. Don’t prioritize money—it’ll likely hurt your exposure. Don’t sign away exclusivity—hang on to your right to ‘be everywhere’. Go cross platform and get your film everywhere. 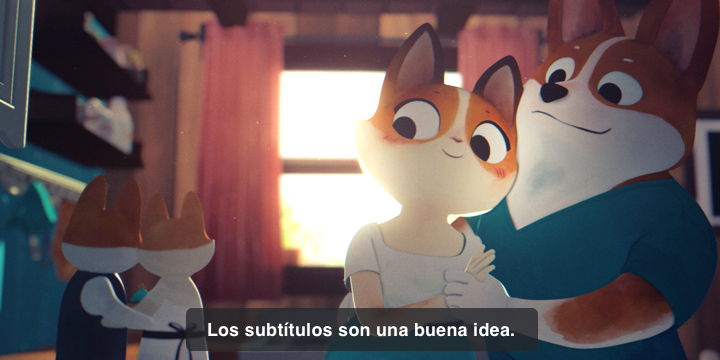 Internationalize your film with subtitles to reach even further. Compress your release window over days/weeks rather than months/years. Launch, engage and recalibrate during the week of your release. Be prepared to pitch your next idea or project. While some are lamenting the crumbling of our traditional film institutions, the truth is there’s never been a better time to be a filmmaker. The world, now more than ever, is in search of great stories as new players Netflix, Amazon Studios, Apple, Hulu, YouTube, and Facebook invest additional billions into new, original stories. And it’s not just studios—it’s brands, news, games—you can’t connect with an audience of any kind today without telling a great story. At the same time, the internet has upended traditional gatekeepers and blown the doors wide open so that anyone with a great story can find an audience. The next generation of filmmakers are those embracing this whirlwind of change and charting a new path. At Short of the Week, we live and breathe great short films. We’re not a platform looking to sell ads. We believe in putting power into the hands of filmmakers with no exclusivity, cross-platform releases, a strong media network, and industry connections to help filmmakers reach audiences around the world and take the next major step in their careers. If you’re looking for help with your short film release, consider submitting your short film.